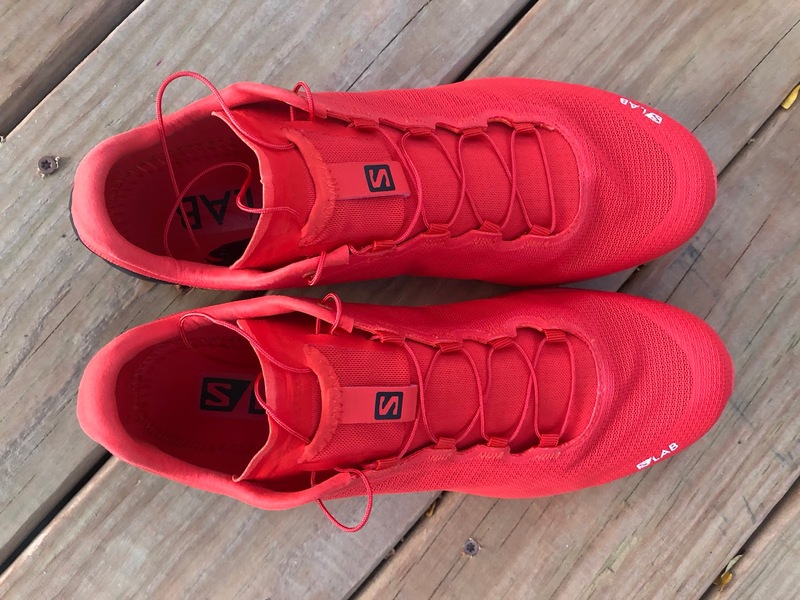 Jeff: I have not run in the S/Lab Sense SG since version 3, which I liked, but were a bit to thin and not quite durable/protective enough for my daily runs on rocky, technical trails. The SG 7 feels even lighter and more pared down, with noticeable refinements in the upper, as well as somewhat of a reworked outsole, completely continuous vs. the weight saving cutouts used in the SG 3. Trying them on, they just feel impossibly light and just beckon to go fast, partly because of the low weight and pared down nature, but also feel responsive just standing still. Plus, in bright red, you just kind of have to run fast in them. Expecting them to be very narrow and slim, I was a little surprised that even with a race fit, there is a bit of extra room in the forefoot, not sloppy, but accommodating. 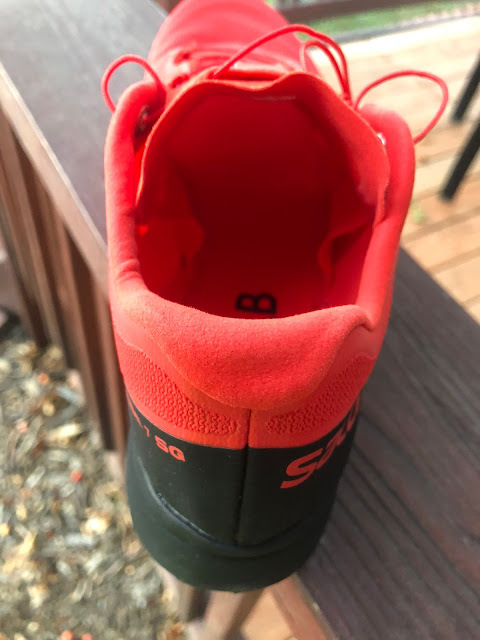 I was also struck by the narrowness of the outsole particularly in the midfoot and heel, questioning if the SG 7 would be stable in technical terrain. 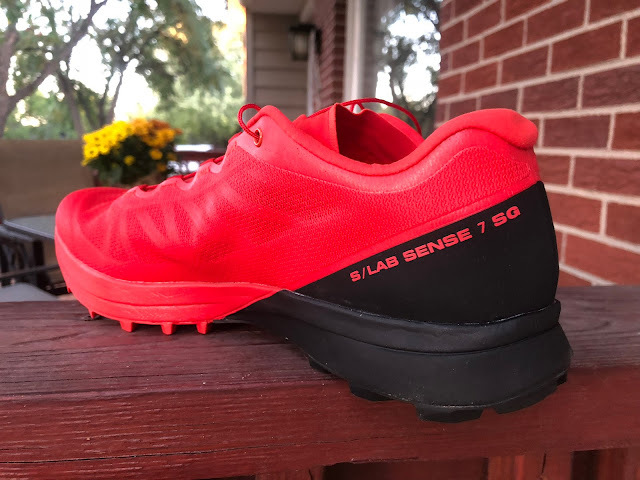 Sam: The Sense 7 is my first S/Lab Sense and I was somewhat terrified that such a light minimal shoe would just not be enough underfoot for slow old me. The Sense 7 SG represents years of careful refinements to the "Kilian" shoe, a pure trail racer created for the Salomon S/Lab elites. With version 7 the big focus was on reducing weight while maintaining all capabilities. The wizards at S/Lab got the weight down from the prior version's 7.9 oz to an amazing 7.4 oz/211 g for my size 8.5 US. so about 7.6 oz / 215 g in a size 9. Most of the weight reduction comes from the new upper it appears. The price does not go down with weight, still $180 for this incredible work of shoe craftsmanship. I visited the Salomon S/Lab this year in France (article here) and was stunned by the custom design and manufacturing capabilities. 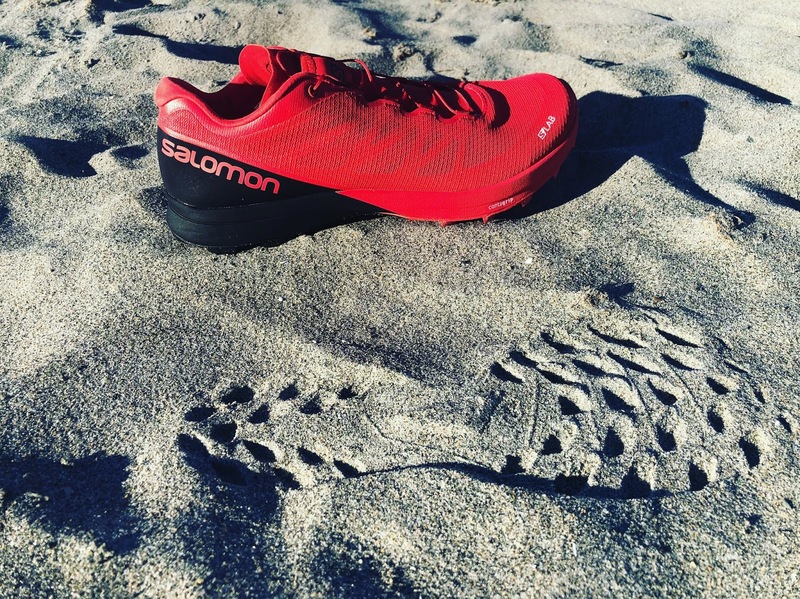 Over 20 elite Salomon runners have shoes made to their exact requirements and to their exact foot shapes. And it goes on with custom alpine and nordic skis and boots for many snow sports athletes all crafted under one roof at Salomon HQ. The work shows, and fortunately unlike the S/Lab Ultra, here the fit is for more "normal" feet. While "pull on" is arduous, once in and QuickLaced up, I had a big smile. 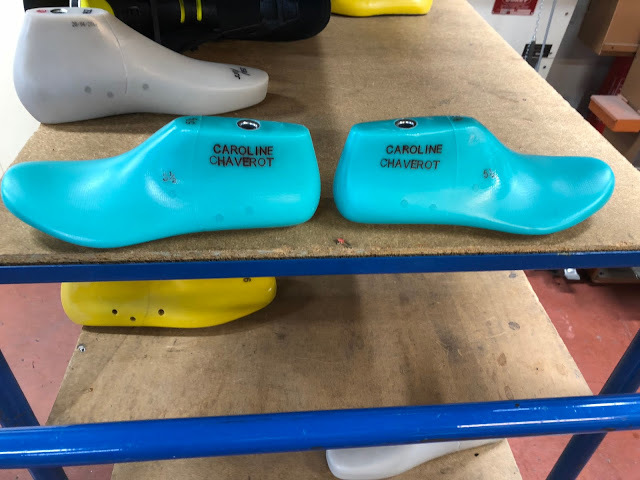 A perfect foot hold, secure, no pressures and stable with a surprising amount of toe overhead room and front width as there are essentially no overlays or bumpers up front and the single layer mesh is thin. The SG 7 has perfect true to size fit for me in a performance type shoe. In fact this same upper would make a s sensational road race shoe upper as well. 22mm heel/18mm forefoot, including 6mm lugs. Jeff: The single layer quick drying breathable mesh upper is a piece of work, extremely thin, light and ventilated, yet durable feeling and very secure. Security in part comes from the thin, but well integrated overlays, combined with the booty like SensiFit system. Even though minimal, comfort is top notch, feeling like a favorite pair of slippers. Fit is true to size, if just a slight touch long. When first trying with my normal thin summer socks, I noticed a bit of extra room at the tip of my toe and extra material vertically in the toe box, however when I shifted to a slightly thicker sock (medium to thin medium), it filled enough of that slight gap that I no longer noticed the extra room. 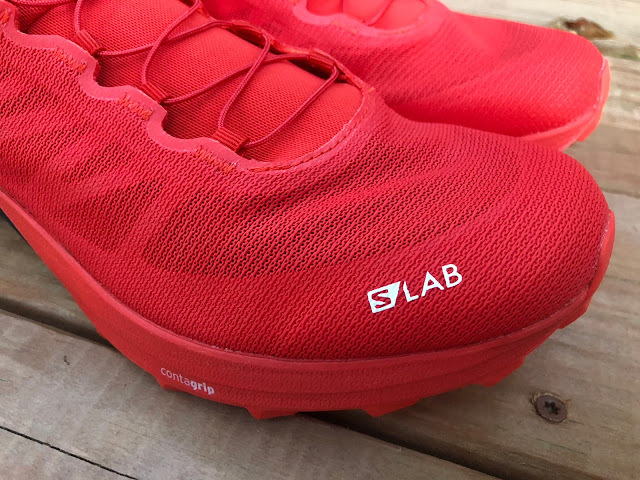 I would characterize fit, particularly the toe box to be slightly more accommodating than other S/Lab models, particularly more friendly and less tapered than the S/Lab Ultra (the Francois shoe) and I think it will accommodate a wider range of feet. The toe bumper is essentially non existent and flexible, essentially just slightly thicker reinforced mesh more for durability than warding off any rock stubs. Despite the lack of toe protection, I have not yet had any trouble, even in very rocky and technical terrain. Like most Salomons, the SG 7 employs the very effective Quicklace system, which snugs nicely with no readjustments needed, set and forget. The lace garage is top access vs. the traditional bottom access, something I am appreciating more and more. The heel counter is low and very minimal/flexible, yet is very secure and comfortable. Padding around the collar is very minimal, yet I don't feel as though I need any more. The paper thin tongue is integrated as part of the SensiFit/Endofit system and works very effectively for midfoot lock down, stability and security. Often times a tongue this thin can be bothersome to me, but not at all in this instance, with no excess pressure, constricting or lace pinch. The sockliner is also integrated for additional weight savings. Sam: I concur with Jeff's fine description of the upper. I am stunned that such a minimal upper can provide such secure, comfortable, and flawless fit and support. I tested water draining by fording some streams in Maine. The SG 7 drains very fast and absorbs minimal water weight but does have a squishing sound under foot from the glued in very thin sock liner. Jeff: The dual density compressed EnergyCell+ midsole with ProFeel film provides a very responsive, snappy and lively ride with an excellent balance of protection and ground feel. Alhough the SG 7 is very much on the minimal side the cushioning is surprisingly sufficient for several hours of hard running on just about any surface. The midsole geometry and dual density Energy Cell+ midsole in combination with the outsole prioritizes forefoot stability, cushion and push off as the heel and mid foot platform is very narrow while the forefoot quite broad. After all this is a shoe designed for speed! Best as I can tell slightly softer foam is in a layer just below the foot at the heel and up front just above the outsole. This said the heel cushion at all paces while firm is in no way overly harsh or punishing and I was surprised at how stable the heel and mid foot were. The Pro Feel film from mid foot forward provides noticeable rock protection without impeding trail feel. It is not a firm plate for sure so rocks are felt but never sharply. The SG 7 balances more than adequate protection and cushion from such a thin midsole and lugs stack of 22 mm heel / 18 mm forefoot including lugs with a sensation of the terrain's contours underfoot. 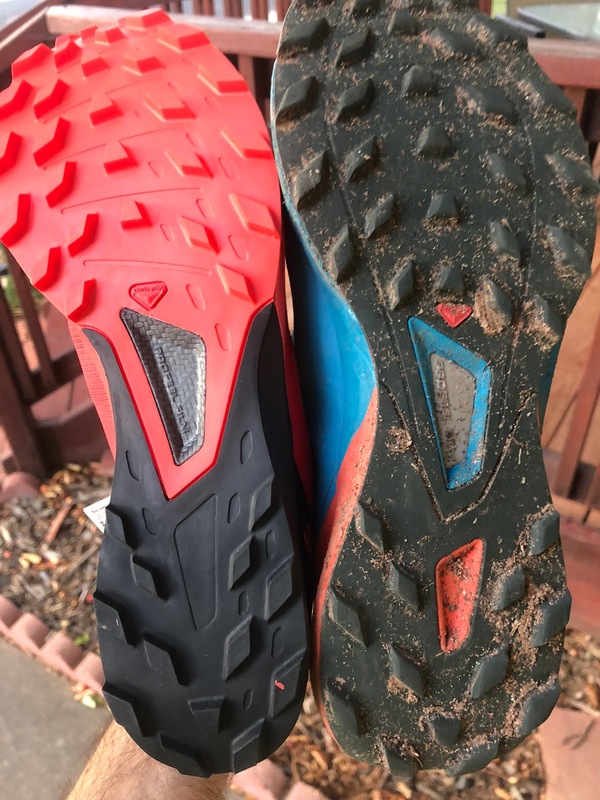 Is it probably not a midsole for long, long runs and Ultras for most but for Salomon elites for sure and for those used to a more minimal feel overall. I have no problem running them up to 2 hours on hard surface rough terrain but my feet were a bit sore overall after, particularly the heels. On softer terrain I could go much further. The Premium Wet Traction Contagrip outsole combined with deep 6 mm lugs provide excellent traction on all surfaces, wet or dry. The outsole is notably narrow. 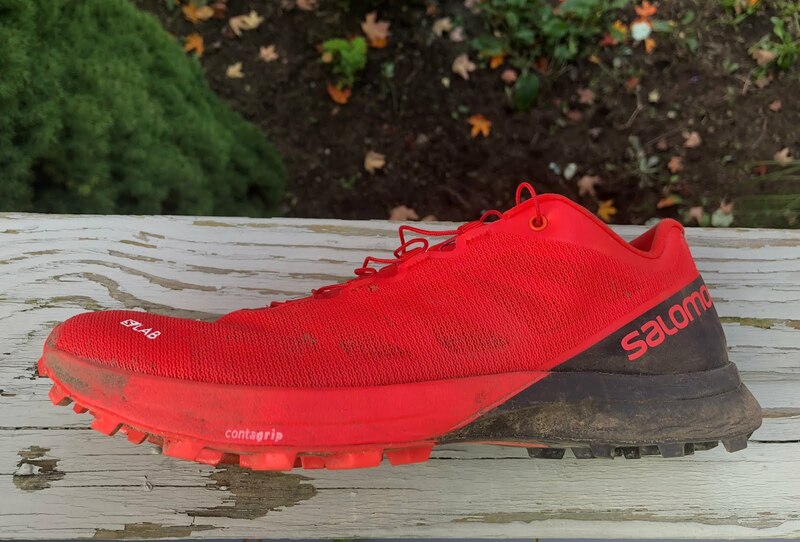 I found the Sense Pro 3 to be a particularly narrow shoe, particularly mid foot with a significant medial cutout causing me a bit of instability. Compared side by side however, the SG7 is notably thinner, causing me a bit of initial worry that they would be even less stable. Those concerns turned out to be unfounded however, as the SG7, though even more narrow than the Sense Pro, is particularly well balanced and agile with no stability issues whatsoever. Just for grins, the SG7 side by side with the widest shoe in my fleet, the Hoka One One Speedgoat 2. 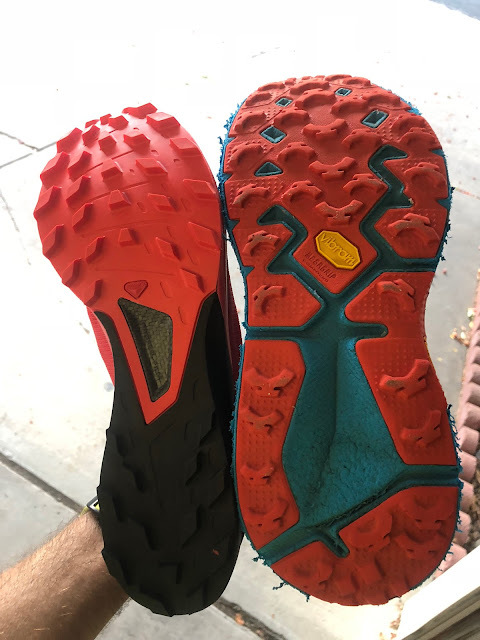 The outsole durability of the SG7 is my only real concern, though I do readily admit that since this shoe declares it's primary use as Soft Ground right in the name, my abuse of it on harsh, rocky, technical mountain terrain is not necessarily deserving of too much criticism. 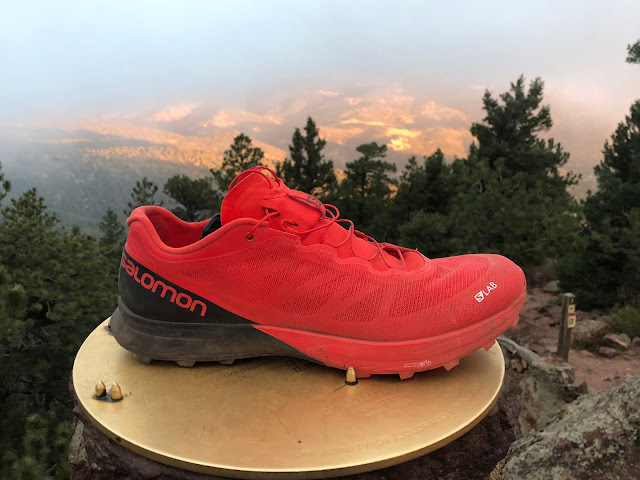 I only mention to help guide anyone considering this shoe that it truly is best for soft ground, even though it performs well anywhere, it just will not last long on the rocks. Sam: The Contagrip outsole is excellent on all terrain but shines on the softer. The grip in mud was excellent. I can't wait to run them in the snow. I did find traction on smooth wet, slimy green granite slabs particularly at the wide spaced red front lugs was very poor, almost non existent, but to be fair not many shoes grip well on this type of rock. The wide spaced lugs and their small individual surface areas are for sure a factor on this type of surface. On firmer terrain even road the big softer front lugs contribute to cushion. Like Jeff I found them considerably more stable than the Sense Pro 3 and also last year's S/Lab Sense Ultra. My test terrain in Maine and New Hampshire is mostly in the forest with a mix of single track and old cart paths. The terrain is not mountainous but hilly, and relatively soft compared to Jeff's, with copious rocks, mud and roots mixed in. 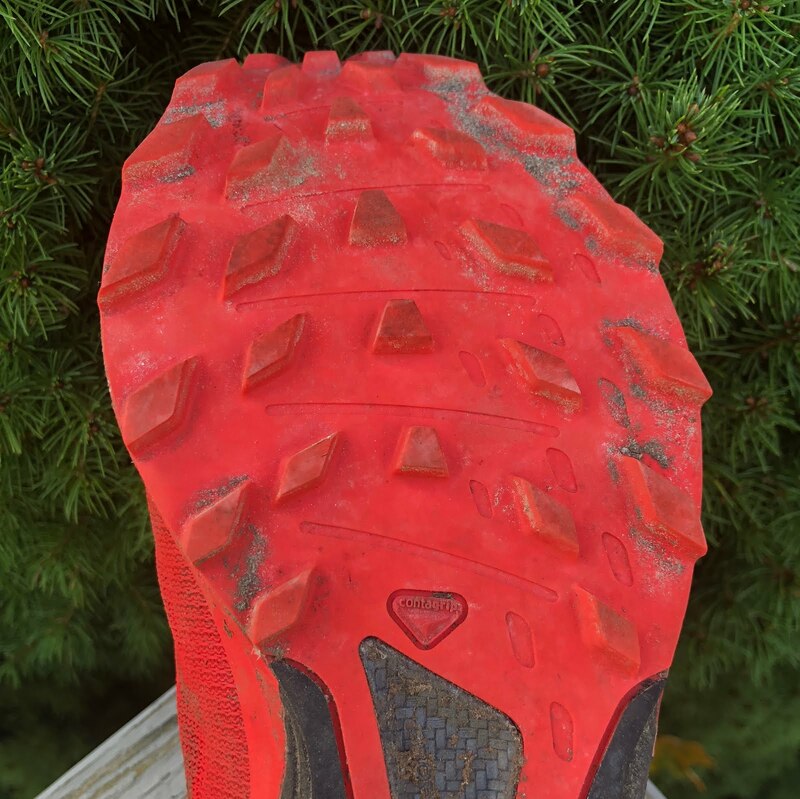 At 15 miles I have no wear whatsoever on the outsole and that includes a couple miles of road. So for its intended soft ground purposes I believe the Sense 7 SG outsole should hold up very well. 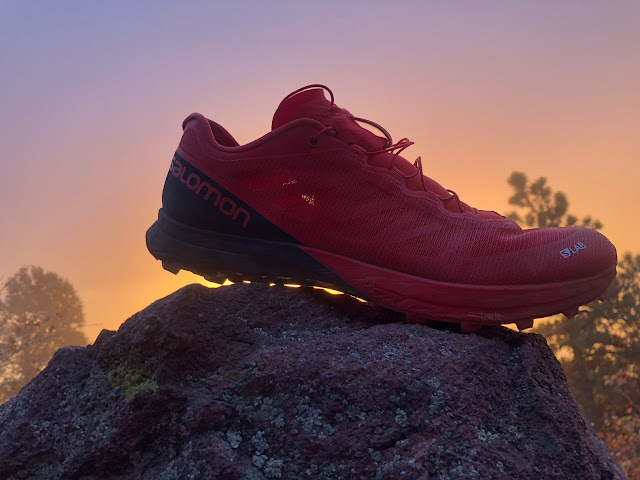 Having missed the last 3 iterations of this shoe, I was very much impressed with the overall improvements that Salomon has made. Already a great shoe, the 7th version is impossibly light, super responsive and fit is very secure, though simultaneously a bit more generous in the toe box. Though I would not hesitate to run in the SG7 almost daily, given how light, protective and reasonably cushioned it is for the weight, but mostly as how fun it is to run, this is a race day shoe. 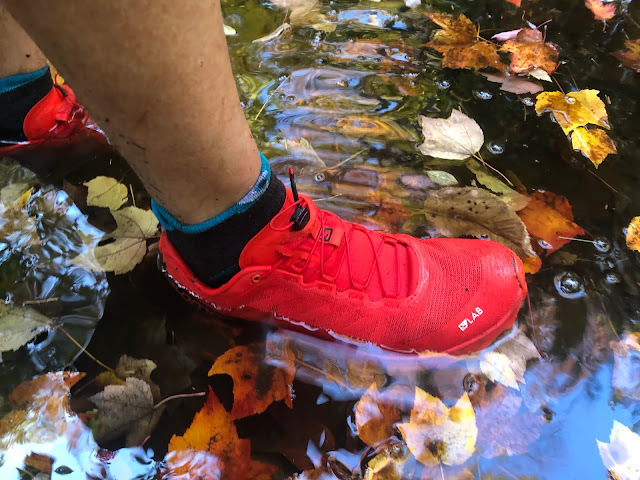 Truly built for soft ground given the wear rate of the outsole, the SG7 is best suited for wet, dirty, duffy, muddy, fells or snowy terrain (OK, summer snow and warmer conditions, as this is by no means a winter shoe). Though the SG7 even excels on rocky terrain, talus, smooth cruisers and pavement, I would use sparingly there given the outsole wear. - .1 for lack of toe bumper. Has not yet been an issue, but would be nice to have just a bit more there. - .1 for outsole durability. 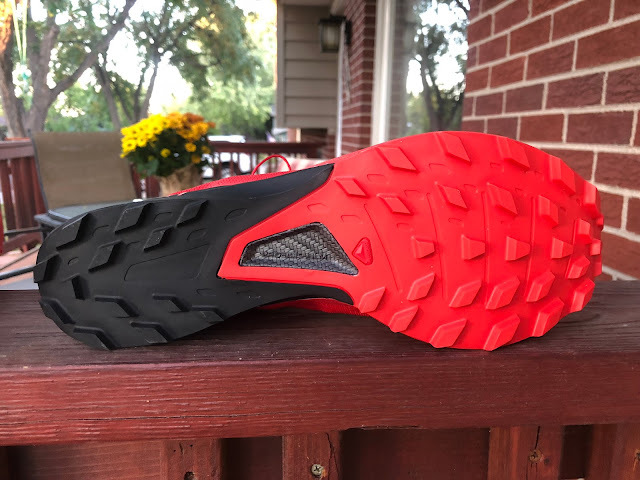 Recognizing that this is a soft ground shoe, I would love to see similar durability as the Sense Pro 3 or XA Elevate, both with amazing traction and are very impervious to wear. Salomon has achieved something special here. Incredibly light with superb upper hold and comfort with a lively and responsive ride this trail racer represents the state of the art in trail shoe design superbly executed for its purpose. Much like the Nike Vaporfly it is not just a shoe for the top elites but for long hard hauls it may be a bit to little shoe for most mere mortals. Its flawless secure fit, agility, decent cushion and protection is striking for such a light shoe. I find it ideal for my hour or so jaunts in the forest where all kinds of terrain are encountered. I really look forward to running them this winter in Park City on packed and unpacked snow trails. I have no problems with non winterized shoes if actually running and not hiking. I have not run an XC race in years and plan some in part thanks to this shoe whose weight approaches race flats. -0.1 heel foam firmness, could be a touch softer. -0.05 for $180 price. I know its S/Lab but I wish lower level, lower price, similar models such as Sense Pro could approach this level of excellence. We hope to test the Sense 7 soon to compare to the SG. Sam: Not a fan of the Sense Ultra. 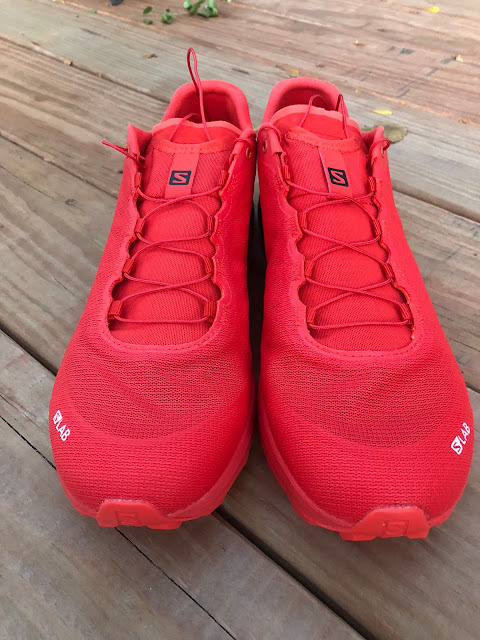 Overly soft with a comfortable but not very secure upper for me on any kind of rough trail. While it would add some weight I do think the wider heel platform of the Sense Ultra would extend the utility of the Sense 7 SG. 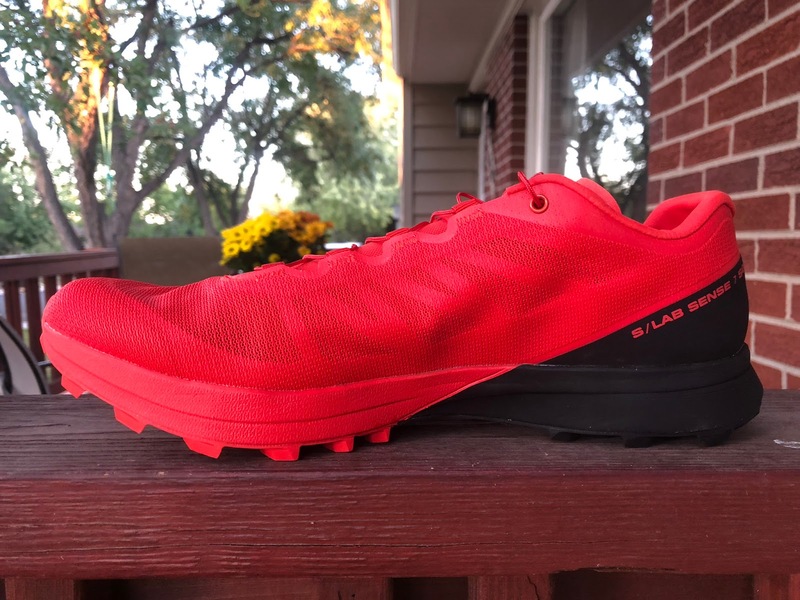 Jeff: The S/Lab Ultra is heavier and offers a smoother, more well protected cushioned ride, yet the fit, with that tapered toe box is not as comfortable (for me) as the more accommodating upper of the SG7. Sam: Clearly a more cushioned ride with the Ultra but a notably dull one particularly at the forefoot. 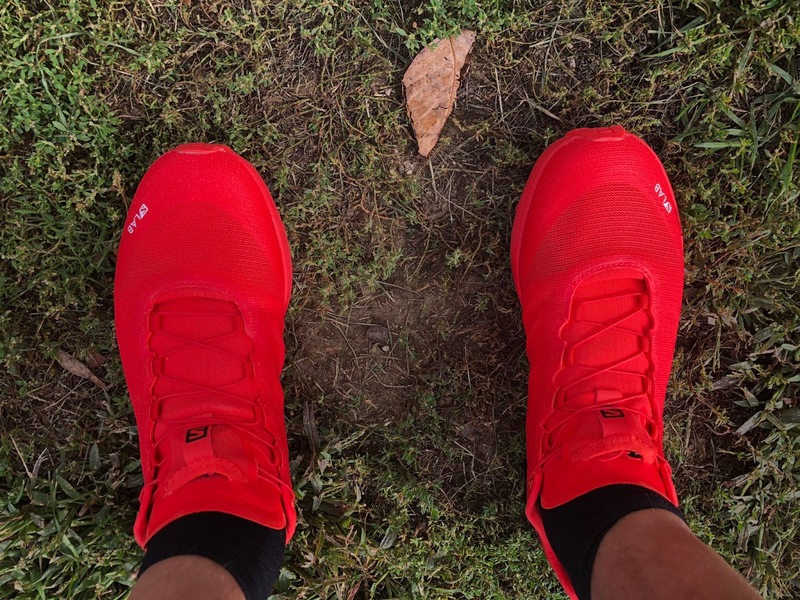 While its upper may prove more durable I would pick the Sense 7's any day for shorter runs as it provides all the support with comfort I need and most notably does not have the very narrow forefoot sides and painful bumpers there of the Ultra. Jeff: The XA Elevate weighs more and is not as nimble, but with more protection, cushion, stability and overall more versatile and durable outsole, is better for everyday use. Sam: Agree with Jeff. Elevate is a better all around every day choice. Jeff: The Ride has better cushion, durability and stability, but the upper of the Ride is not nearly as secure and precise, nor is it even close in response. Sam: I found the Ride upper difficult to dial in compared to the Sense 7. It also has a far forward flex point with less protection there. A comfortable shoe but in the daily trainer class would pick Elevate over Ride any day. 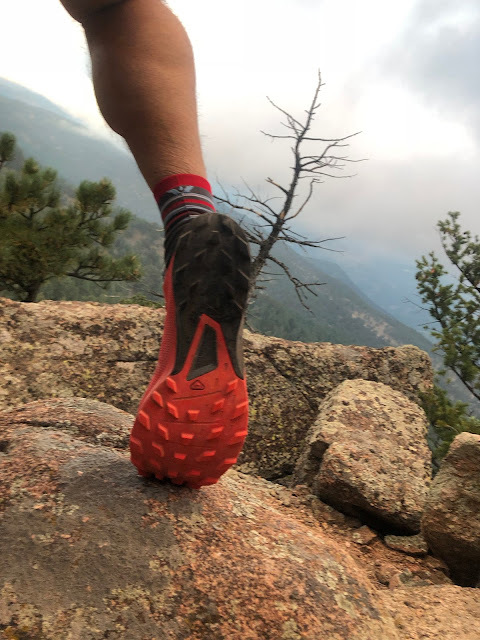 Jeff: The Ultra Pro is a lot heavier, not as agile or nimble, yet offers much more ample cushion, overall protection, stability and more versatile traction/outsole. The SG7 has a much more secure and precise upper, that may or may not be an advantage depending on your use/foot/preference and the SG7 is much quicker and more responsive. Sam: Clearly more heel cushion in the Ultra Pro but Sense 7 SG gets fairly close up front in cushion and weighs far less. Salomon S/Lab Sense 7 SG vs. Saucony Peregrine (6 review and 7 review, but not 8 review): The Peregrine 6 and 7 would be more fitting comparisons, as the 8 gained a lot of weight and is a completely different shoe. No matter, Peregrines have comparable traction, though the SG7 would likely shed mud better. Peregrines (6 and 7) are closer in weight, drop and stack, but the Peregrine is better cushioned and has more durable tread. 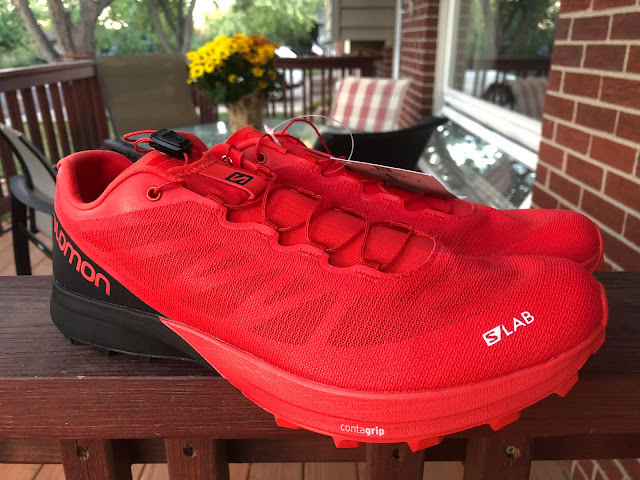 Salomon S/Lab Sense 7 SG vs. Scott Supertrac RC (RTR review here): The Scott Supertrac RC are very comparable in overall performance and fit, though the RC is a bit heavier than the SG7. For that weight however, you get a bit more overall protection and durability, but the low weight of the SG7 and better response has its appeal. 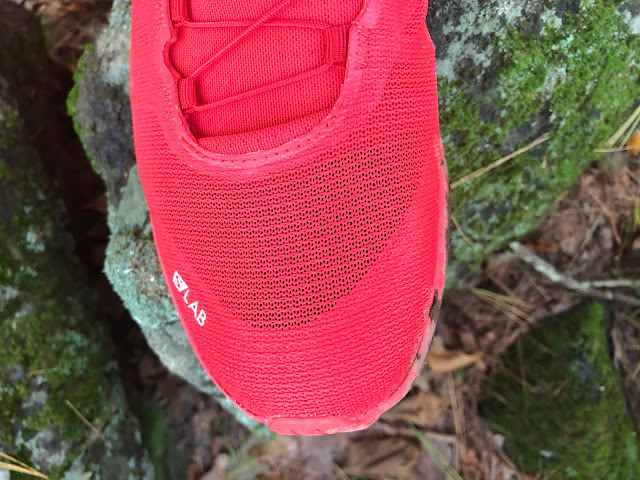 Jeff: Summit Unknown is less expensive and more durable, overall a very comparably performing shoe, however the Summit Unknown gave me some blistering issues on my pinky toes, so fit of the SG7 is much better. Sam: Summit Unknown while not nearly as refined in upper fit, ride, or agility is a similar shoe for considerably less. I have no issues with its fit. Jeff: The Torrent is much more durable and protective with better cushioning for longer hauls, though weighs a bit more and not quite as secure regarding the more precise fitting upper of the SG7. Sam: The Torrent upper and ride are fine but not as precise as Jeff says. It has more cushioning, if softer. Its outsole I think is more versatile. The Torrent bridges training and racing better than the Sense but for pure fast the Sense wins. Put the Sense 7 SG upper on the Torrent and that would be something! Interestingly, Laura Orgue was running a sense 6 sg upper with a much narrower heel, which I'm led to believe was the mid/out sole of the sg 7. When asked about it I recall her saying it was a personalized shoe for VK's, but now it's almost obvious that it was a hybrid of the sg 6 and 7. While the overall shoe is once again awesome, I'm going to miss the ability to use this in cold weather and even light snow. The 6 sg is relatively warm and sufficiently good at preventing my feet from getting wet. I have been waiting for this review. Thank you for your exellent work. Your reviews have been very helpful. Did you have the oportunity to test the 7 alongside sg 7? Xavier, yeah, a bit light for winter use, but the traction would be good though. Perhaps those warm and sunny winter days of spring snow, but then there are certainly better shoes for that specific application. Jon, thanks, not sure on the non SG version of the 7, we are trying, but still unsure. While i like the Sense series and I ran everyday with them, my calf muscles took a beating - better to use them in rotation. I wish Salomon would make a fast light cushioned shoe for ultras like the TNF flight RKT. They kinda ruined the Sense Pro series by just disguising the Sense 6 as a Sense Pro 3. We need more drop and cushion for Ultras. And the Ultra shoe is just too heavy. "Put the Sense 7 SG upper on the Torrent and that would be something!" The upper, fit, weight, traction/grip, and low drop make the 6 SG so amazing for nearly all but super hot weather. But I can't wait to get my hands on the 7 sg! They have certainly grown on me over the past few months. And the narrow heel used to worry me but now I've come to the conclusion that the actual heel cup and upper weren't affected, rather just the mid/out sole that would bulges out a little in the 6 SG. Have you checked out the Ultra pro? I believe it's a bit lighter than the regular Ultra. 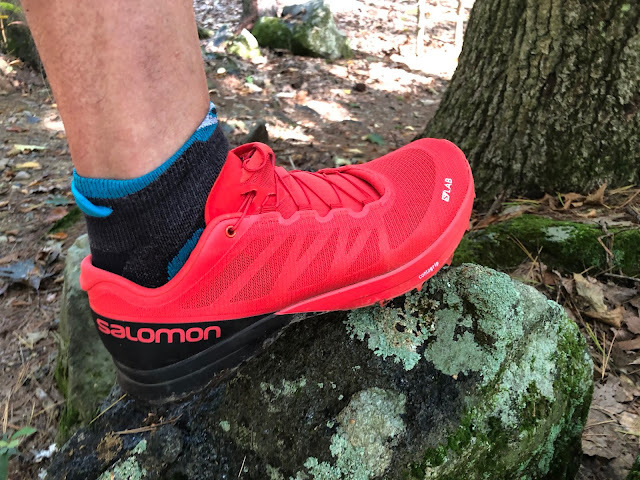 Indeed we have reviewed the Ultra Pro here: https://www.roadtrailrun.com/2018/06/salomon-ultra-pro-review-versatile-and.htmland all of our reviews 100's are indexed at the link below. The Ultra Pro is actually heavier than the S/Lab Ultra as we weighed both. At the trainer all day trail shoe level from Salomon the XA Elevate is still the one Jeff and I like best. Hi Xavier, as Sam mentioned we did review and Ultra Pro, though advertised as lighter, is indeed 1 oz. heavier per shoe in my US Men's size 10. Comparing the shoes side by side, it makes sense, as the Ultra Pro just seems like an overall bigger/bulkier shoe than the Ultra. We have inquired about the advertised weights vs. the actual weights, but have never got clarification, though it could be that our shoes were pre production models, but no real conclusions. As Sam says, the XA Elevate is still our favorite of them all for overall versatility and performance. Thank you for the correction! For some reason I figured that the pro was lighter than the regular Ultra. Looks can be deceiving. I ran six miles in these today and this distance felt forced running on this midsole. Super firm! I am someone who ran in the New Balance MT 10 for several years and went to the sense line to get some more protection for the techy and rocky trails here in Central Texas. This has fit the bill for several generations of this shoe. 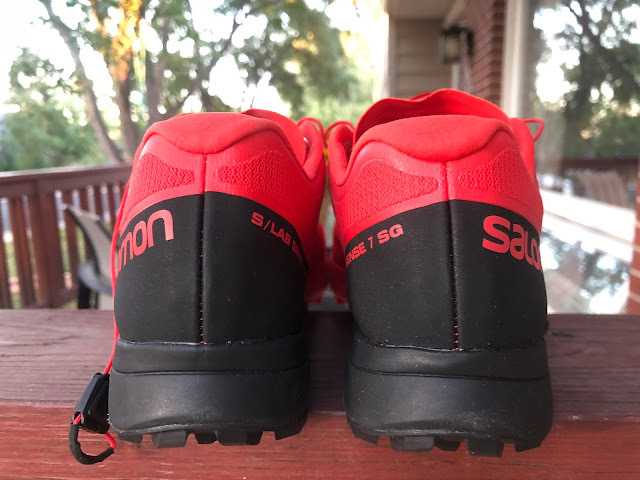 Now that I can't return these (bought from Salomon can you guys make me feel better by telling me that the sole mellows out over a few runs?? That being said this is the best upper that's ever gone over my bare feet. Fits like a glove and makes me feel so conflicted over a trail shoe. Try changing out the insoles for thicker Ortholite ones. For the Sense 6 I use the insoles from the S/Lab Ultra. Problem is that it's a perfect fit without an insole added. If I add to it, it'll just cramp up the shoe and change the dynamic of the ride (cause a new problem by fixing the current one). Again, if anyone knows if the midsole relaxes at all after some use, I could be convinced not to sell these. I think that these shoes will definitely loosen up as the miles rack up. And I've done 60km+ in the 6 sg and can honestly say they're good for that distance, and handle technical terrain very well. Same midsole and sole. Like Bobcat I had also removed the very thin glued innersole from my sense 6 sg and replaced them with the innersole from a pair of my original sense ultras (that have seen better days). This transforms the shoe with a little extra cushioning which gives far more comfort for loner runs.